"The purpose of reporting game scores and meet results on a regular and timely basis is primarily to enhance the credibility of Canadian Interuniversity Sport and our Regional Associations." -- section 30.30.1 of the CIS Bylaws, Policies, and Procedures. Seriously, do scorekeepers at women's basketball games ever look at the team roster? There is or was a Michael McDonald on Laurier's men's team, but I'd like to think the people who are apparently watching these games can tell the difference. And who knows, maybe there are two Murphys on the Golden Gaels. Anne played virtually every day except November 24 and Alex played only on November 24. Makes sense, right? Anyway, it won't matter to the majority of basketball fans, who probably skip right over "Sephanie" (if they ever see the boxscore in the first place). And I'm not sure what my point is, other than "the CIS is small-time and its record-keeping is a disaster." I wish I was making that last one up. There are two possibilities: the scorekeepers are incorrectly copying the names from the roster sheet, or the spellings on the team rosters are inconsistent from game to game. Neither mistake is hard to fix; neither mistake should happen as often as these do. And this is just one sport--or, actually, about half the female players in one sport. Wrong names have also appeared in hockey (if not everywhere else) and it's not acceptable for a sports league that wants to be taken seriously. We won't even mention the statistical mistakes. So, to whoever's screwing this up: Can we please see some kind of improvement next year? This is getting quite tiring. Who knew "Purvis-Collins" was so hard to get right? Check out Winnipeg's team stats: three different versions of Caity's name. (Also, if you follow that link, you'll find out why she presumably goes by Caity.) Fewer misspellings here than with the women, possibly because men's basketball is more popular. I'm not including the Cam/Cameron or Pat/Patrick cases in these lists, but those should be dealt with as well. Well, that's better. Just a few misspellings out of 420-some games with two full hockey rosters in each game. Presumably, the hockey officials don't enter the names manually for each game, but their basketball cohorts do, and that explains the difference. I had the same problem in Guelph — often. This stuff happens all the time with men's basketball, too, as well as pretty much every other OUA sport. Nice work on the examples: that shows how prevalent the problem is, especially considering that that's only one sport. What's even better is when they have the same guy twice, spelled the same way, but with different statistics: then you have no idea which set's right. 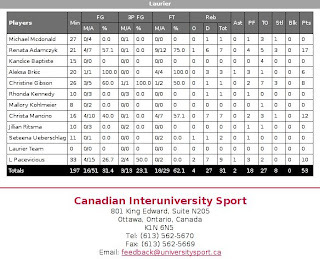 A great example here where they recorded Travis Mitchell playing twice for Queen's in the same match, and putting up either two points and five rebounds while shooting 1 for 7 from the field in 21 minutes, or 14 points and seven rebounds while hitting four of ten attempts from the field in 28 minutes. Clearly, they can't both be right and you obviously can't simply combine them, so it's pretty tough to write anything about that without being proved wrong later. Hockey's even worse, as the OUA stats and LeagueStats never seem to agree on anything. It makes it very tough to cover any games that you're not present in person for, and those can even be difficult at times due to these kind of stats foul-ups. If the OUA and CIS want more media coverage, they should really look at trying to improve this stuff. P.S. I think your idea that the scorekeepers are copying the names incorrectly is probably right. I'm pretty sure coaches turn in handwritten lineups in some of the sports (I've seen it take place in CIS soccer, not sure if it's the same in other sports): if their handwriting's anything like mine, it's got to be pretty difficult to translate the spelling accurately, and then that of course results in problems when the names are entered. What might make more sense is to enter the names directly from the programs handed out at most events (or the team lists used to make those programs). There's still inaccuracies in those, but at least they're usually closer, and there's no handwriting issue. Post updated with misspellings in men's hockey and basketball. I don't know what process the CIS and its conferences use to double-check their boxscores, but I strongly suspect there is no process. The info's sent in, then nobody looks at it ever again. How else does one explain Mr. Mitchell's or Ms. Purvis-Collins' multiple appearances on the same page? Anytime we play Ottawa in football their scorer records quarterback "John Brannagan" and runningback "Mike Griffin". You're right that there's no double-checking process, Mike. It's sent into the OUA and basically just left there. In fact, once they submit it the first time, it's locked into the system and difficult to then edit. I remember seeing our SIO at Queen's send in stats through the net for a hockey game where the third period shots weren't counted, only the goals (so the shot count was 2-1), noted it, he said they'd have to go through some process to edit it, they never did, and that incorrect shot count still stands today. It's now in the team records, player records, goalie records, and it's ridiculous. By Mike I meant Rob. I have no idea why I typed that. Used to be a b-baller myself back in high school. My name is not very common and even nowadays, people write my name wrong!